There was more fanfare than normally accompanies an office lease when Spotify earlier this year inked a deal to expand its Manhattan offices in a relocation to 378,000 square feet at Silverstein Properties’ 4 World Trade Center. The popular music-streaming app needed the extra elbowroom as it planned to add 1,000 new jobs. Gov. Andrew Cuomo — who offered up to $11 million in rent rebates — even broke out his Spotify playlist. The deal illustrated a tidy correlation between employment growth and leasing activity: Spotify was more than doubling the size of its workforce, and it was moving into a new office twice the size of its old one. Now, as another three-month period comes to a close, economists and data wonks are busy crunching numbers on employment for the quarterly ritual of analyzing Manhattan’s job growth and office leasing activity. And while conventional thinking might reason that office leasing is directly related to the number of jobs added, experts say the correlation is – at best – a loose one, and there many other factors at work when it comes to leasing activity. “It’s a general indicator,” he added. In fact, looking quarter-to-quarter, one would be hard-pressed to interpret how job gains are affecting the office leasing market. Using data from the state Department of Labor on six “office using” employment sectors, The Real Deal charted employment gains over the last few years against leasing data provided by CBRE. What the chart shows is that jobs usually follow a smooth arch, the ups and downs of which can be measured against years-long economy cycles. Office leasing, however, is more “lumpy” from quarter to quarter, swinging erratically at each interval. While job growth certainly plays a factor in leasing activity, experts say market fundamentals do more to dictate how active tenants are. Expensive rents and tight availability, for example, will put a damper on leasing, while activity will pick up when space is more affordable and available. 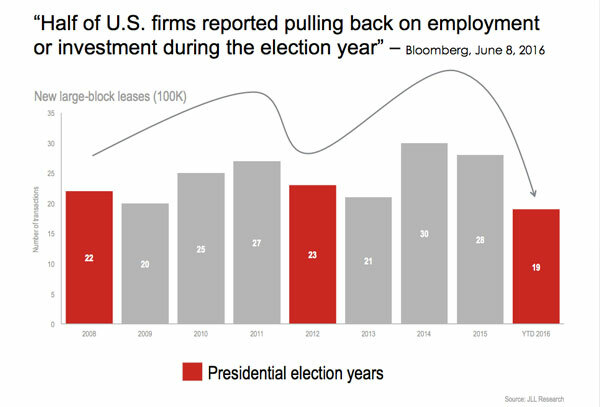 There are times when job growth and leasing move in tandem, such as when there’s a general sense of uncertainty in the market. Job growth and leasing activity took a pause in 2016 as happens every election year, Ashby said. Regardless of employment, leases expire on set terms, and expirations and renewals will always drive a certain amount of activity in each quarter. And while companies can move relatively nimbly when it comes to the size of their workforce, leasing decisions operate on longer timelines. And not all new jobs are created equal. Earlier this year, the commodities firm Glencore signed a 60,000-square-foot lease at Vornado’s 330 Madison Avenue to relocate its offices from Connecticut. 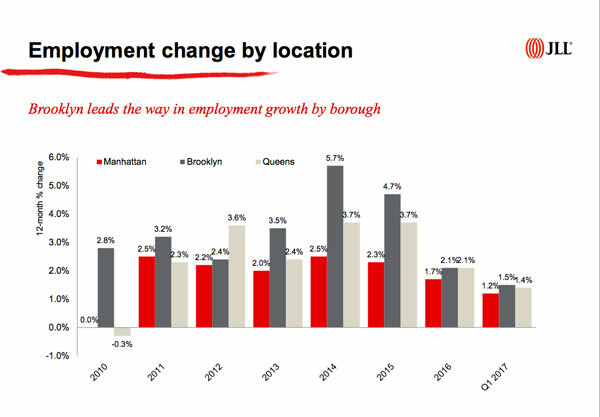 That’s an example of a direct correlation between job growth in the city and leasing. 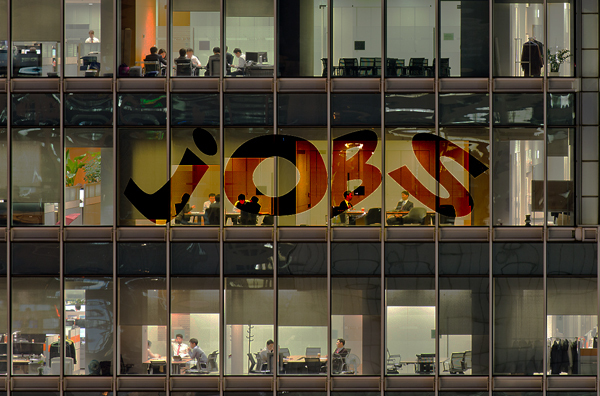 But other companies may not have such a direct need for new space as they hire new employees. Cushman’s Murphy said many companies laid people off in the downturn of 2008 but didn’t actually put their space on the market. He recently met with a company that has 400,000 square feet, but only uses about 65 percent of its space. In previous economic cycles, such as the run up before the dot-com bust in the early 2000s and the most recent one before the Great Recession, Manhattan’s office employment and the square footage offices occupied have generally correlated with each other. But beginning in the recovery that started in early 2009, the two began moving in opposite directions. While office employment grew from about 920,000 jobs in December 2009 to shy of 1.1 million as of June, occupied office space actually declined from nearly 523 million square feet to about 515 million square feet during roughly the same time, according to Savills Studley. Given this loose relationship between jobs and leasing, how does a landlord interpret employment numbers when devising a leasing strategy? Rudin Management Company CEO Bill Rudin said that while he pays attention to the overall numbers, he looks deeper at what kinds of business are driving growth in order to determine how to attract the kinds of tenants showing the most growth. And Jeremy Moss, the head of leasing for Silverstein Properties, said that beyond the broader trends, it’s more meaningful to look at where the newly created jobs are filling offices, noting that the expansion of the office market into places like Brooklyn and Long Island City mean landlords have to think in new ways about how job growth affects the market. And he warned against drawing conclusions from one or two quarters of data.